Looking to stay in self-contained holiday rentals Mackay. Try The Shores Holiday Apartments two bedroom Deluxe Villa’s. Located close to the beach, BBQ’s, swimming pools, tennis court, and other recreational facilities. Ideal for families. On entry, the cool tiled floors and ceiling fans make a relief from the balmy sub-tropical weather. For those wanting even more comfort they are air-conditioned throughout. Each ground-floor deluxe villa has a large modern kitchen. Ideal for guests who enjoy cooking. Furthermore, they have a dishwasher and two door fridge. The meals area has a dining table large enough to seat six people. The laundry has a washing machine and clothes dryer. The layout has a spacious open plan lounge/dining room. The lounge has 2 comfy couches. One is a double sofa bed. Great for relaxing while watching Foxtel on the flat screen TV. There is a DVD player in the lounge room. A large collection of movies are available from the office to borrow. Besides that, internet service is available with free WiFi. Listen to your own music using the iPod docking station. The master bedroom has a plush premium queen size bed and TV with Foxtel. Bedroom two has twin single beds. Also a premium quality. The bathroom has a spa bath, vanity and separate shower. Laundry facilities are also included in each villa for your convenience. Eating al-fresco is an option using the outdoor seating provided at your deluxe villa. Communal BBQ areas are also available. The nightly rate is for 4 guests. Extra guests are welcome at an extra charge. The total number of people allowed to stay in a unit is six using the sofa bed in the lounge room. The price varies depending on the length of stay. Check out our availability and weekly rates here. 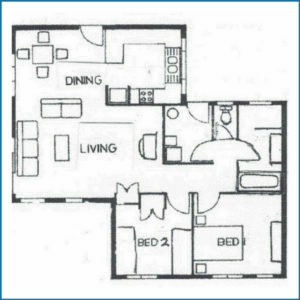 Click here to view the property layout.